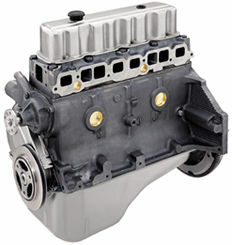 The model of Mercruiser 3.0L 4 Cylinder Engine can be determined by looking at the last letters of the engine code which is stamped in all complete Marine Longblocks by General Motors at the time of assembly. If the serial number and/or model decals are missing the marine engine code will help to determine the engine model. 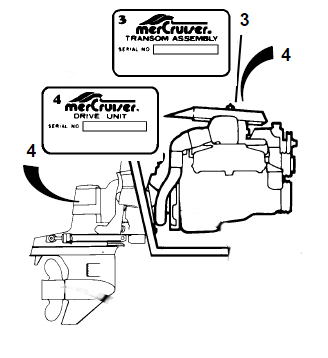 Refer to the drawing for engine code location. When it comes to engine horsepower versus torque in marine applications, most people make the common mistake of focusing on horsepower rather than the torque. 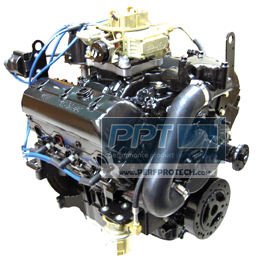 When it comes to both gas engines as well as diesel engines, in most cases focus should be directed to the torque more so than the horsepower. There is a common saying with in the OEM industry that “Horsepower sells a boat however Torque is what actually moves it”. This could not be closer to the truth! One should realize that horsepower is really a measure of the torque over a given period of time. This taken into account by the rpm variable in the specification. The following equation may help to shed some light as well. It is interesting to note that the formula also verifies the typical torque bell curve when the torque trails off as rpm increases at the top end. 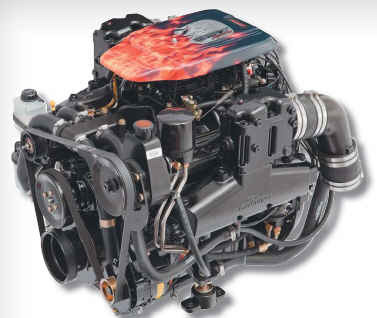 One may consider that engines making torque at a lower rpm tend to work better in marine applications due to the fact that “most” boats tend to plane in the range of 2,000 – 3,000 rpm. 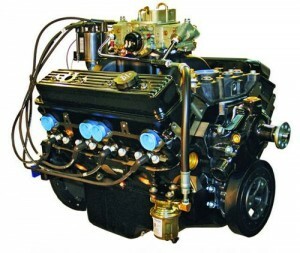 It’s not by chance that most marine engine manufacturers continue using the larger displacement – lower rpm, cast iron marine engines because of this fact. Many people wonder why these manufacturers haven’t changed over to the high rpm engines the automotive industry has been converting to over the past 10 years; for the same reason the LT-5 Corvette engine and Lexus V8 engines didn’t work very well in these marine applications — nice Hp but at higher rpm’s and therefore poorer low rpm torque characteristics. Another interesting item to note is that since the proper method for propping a boat is to select the size prop that allows the engine to turn at it’s maximum allowable rpm. 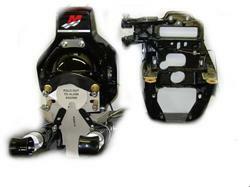 It is required that a similar level of torque be produced at the top rpm condition as well as the proper planing rpm for a given boat hull (draw a straight line across the torque bell curve and see at what “lower rpm” this takes place. If this is not the case the selected prop will over-load the engine at the boats planing rpm and therefore yield very sluggish low rpm performance characteristics. For example a high revving engine that makes 400 hp at 5500 rpm would be making about 382 Lb-Ft torque (using the above formula) at 5500 rpm, since it would have a maximum torque output at probably 4,000 rpm it would be likely not to produce enough torque at 2500 rpm to make the boat plane very well since the prop was selected based on the 382 Lb-Ft value. Notice the higher the rpm an engine makes it’s torque the worse this situation becomes. In contrast to this; large engines that make significant horsepower at “very” low rpm’s will therefore make a tremendous amount of torque, but at extremely low rpm. 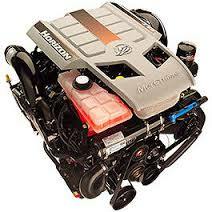 For example a diesel marine engine that makes 300 Hp at 2,000 is making 788 Lb-Ft at this same rpm. Noting that the torque curve is generated in “bell form”, and therefore the maximum torque could be as high as 900 Lb-ft on this 300 Hp engine. Comparing this against a 300 Hp GM small V8 engine that makes 300 Hp at 5,000 and 375 Lb-Ft torque at 3200 rpm, this is a considerable difference. 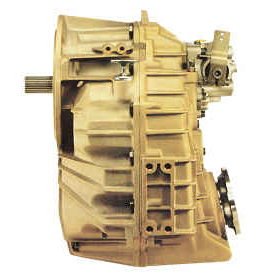 Very low rpm diesel engines typically make tremendous low rpm torque and therefore require specific gear ratios not supported by sterndrives, as well as requiring much larger diameter prop shaft’s. Since overall boat speed is generated by a combination of prop speed and prop pitch (the horizontal distance traveled by a single propeller revolution – measured in inches. Ex 21P means 21 inches of travel with one revolution). For most mid-size boats (up to 40 feet) the best option is a higher revving diesel engine that generates torque at lower rpm. 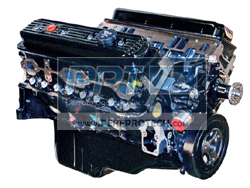 For example a diesel engine that produces 300 Hp at 3600 rpm and makes 500 Lb-Ft torque at approximately 1600 rpm will work out much better than the example above of the 300 Hp engine making it’s power at only 2000 rpm. 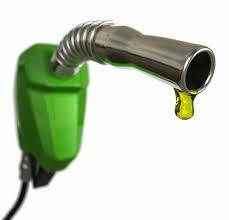 When looking to re-power spend as much if not more time focusing on the torque rather than horsepower.